Whether you are doing customer analytics, fraud detection, or risk assessment, you need connected data. While linking a few data points can be simple, creating connections with significant amounts of heterogeneous data requires a radically new approach. Enterprise architects should read this report to learn how the new and emerging graph database technology offers the ability to link pieces of data easily to create more meaningful and actionable insights. 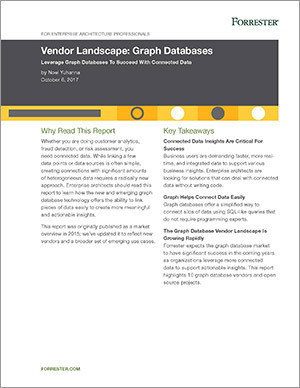 Read this report from Forrester Research and discover why data insights are critical for success, how graph technology helps easily connect data, and why the graph database vendor landscape is growing rapidly. Fill out the form to download the Forrester Research report Vendor Landscape: Graph Databases, Leverage Graph Databases to Succeed with Connected Data.